Pavement ants, a common pest in Ontario, are just one of the 100+ species of ants in Canada. They are a small ant, ranging from about 2mm - 3mm in size. Pavement ants vary between black to a medium brown in colour and their legs are often a lighter brown colour. 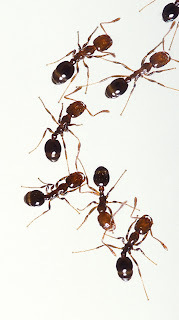 One identifying marker of pavement ants are the parallel groves found on their head and thorax, which are best seen when using a magnifying glass. can sometimes be found indoors. Pavement ants eat nearly any type of food including insects and honeydew from aphids, to animal food, seeds, meats, fruits, and starches - but their preference is greasy and sweet items. Pavement ants can become a nuisance when they are found foraging in homes for food. When found indoors, they are specifically looking for protein or sweet substances needed to feed the queen and the young. How do you prevent pavement ants? There are steps you can take inside and around your home to prevent pavement ants from becoming a problem. Sweep up! Cleanliness is important inside a home or business to avoid any foragers from entering in search of food. It’s also best practice to seal up any cracks in exterior walls to discourage ants from moving indoors. Repair any water leaks and watch for problematic foundation drainage. What treatments are there for pavement ants? There are a number of ways to treat for pavement ants depending on a variety of factors. Often people want to know if they can treat for pavement ants themselves using products found in hardware stores. It is our experience that these treatments are only a temporary fix and don’t get to the core of the problem. We recommend that one of our professionals asses the situation in person, so that the correct treatment is used to maximize results. Typically, when a nest is located a liquid insecticide agent is used to flood the area. 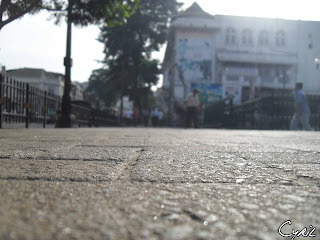 A residual insecticide is used on areas that the ants travel along, like cracks in a sidewalk. For interior problems we apply a dust into walls and baseboards of the home. We do ask that you leave your home for four hours after the treatment is applied to allow for proper drying time. Sawyer Pest Management is licensed by the Ontario Ministry of the Environment and is insured. Each of its service representatives is a fully licensed Structural Exterminator, fully trained and competent in the services they provide. Sawyer Pest Management does not employ unlicensed service technicians. Sawyer Pest Management is proud to provide service programs in the communities of London, Melbourne, Ingersoll, Aylmer, Port Stanley, Strathroy, St.Thomas, Parkhill, Grand Bend, Bayfield, Exeter, Lucan and St. Marys.